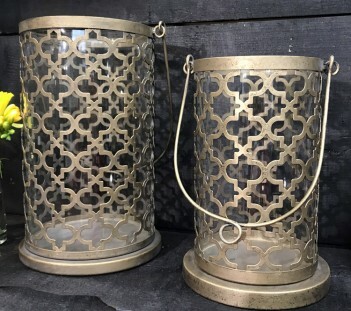 Stunning metal and glass lantern, glass insert sits within a very pretty, metal design holder with handle which has an aged bronze effect. Perfect for a pillar candle (not included). We have the smaller of the two shown in the photo available in stock. Please note the information on the delivery page regarding sending items to you containing glass.